Hennegan's Good Literary Pub Guide! The King & Queen, Fitzrovia, w1. Bob Dylan, Withnail, but not I. There are many pubs in Fitzrovia, just North of Oxford Street in Central London, W1 and most have some claim to fame, but the King & Queen, on Foley Street, in the shadow of the Post Office Tower, is a personal favourite for a number of reasons - although chiefly, as with most decent boozers - because of the staff. It's what we would call a ‘proper’ pub. It's part of a small chain now, I think. According to the website, it's been owned by the family run LEA Taverns since 1985, and a jolly good job they've done too. Like most of the city centre pubs, I've not been there often for last orders and it has TVs and a juke box. But importantly for places to find inspiration, the vibe is good. And the staff are smart in that old-fashioned, no-nonsense way. The second time I went in there, on a fairly busy Friday night, I did single myself out by asking to take a pic of their classic old till, but then I perched on a seat at the end of the bar with a pint of what I call ‘cooking’ lager. Lower alcohol. Carlsberg, in this case. Just as I'd finished it, one of the barmen, faced with a busy onslaught of other customers, noticed I'd finished and nodded to me. “Same again?” Classy. It's a reasonable place to write in as well. Prices are not too bad. Wifi is good. They do food at lunchtimes, although I've not tried it. An old pub, there's quite a young vibe, in its one single bar, but it's a real mixed crowd and in spite of its city centre location, there's a smattering of locals. I got chatting to one chap - a Mathematician - who has lived nearby for over twenty years. He frequents the K&Q precisely because of the staff . “They have a low turnover of staff here”, he told me. “It makes a difference to the ambience of the pub.” And he’s right. It does. They have a function room upstairs too and not only is there a regular folk club, but one of the best spoken word events in town - ‘In Yer Ear’ happens monthly. Ish. It's run by Covent Garden resident and Soho regular, Dave The Hat, a good and true man with ties to Julia Bell, erstwhile writer and head of Birkbeck’s acclaimed Creative Writing course. Even though I consider them friends and I’ve had them both on my radio show (you can hear them on our Podcast page) they are both soooooo cool, they almost frighten me. 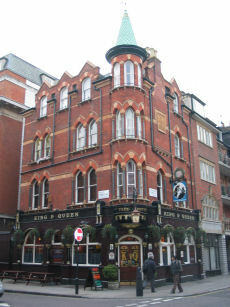 The K&Q is also the place where non other than Bob Dylan performed. Yep, not only did he take his name from Dylan Thomas, another local, but it was Bob Dylan's first gig outside the good old US of A. The story has it that in the days when the BBC could do such things, they hired him as an actor - to play the part of an American Folk Singer! Apparently his acting wasn't too good, but while he was in the area, he thought he'd get his box and ‘monica out and play a few tunes at the local boozer. His performance in the pub was much more successful than his performance on the telly, apparently. No surprise there then! It's worth a visit even if you don't want to write. This area of Fitzrovia is slowly but surely being overwhelmed by new build flats for millionaires, and I fear for its future. But the King has retained many of its original features and you wouldn't be surprised if Withnail walked in, resplendent in Trenchcoat and asked for the finest wines known to man. The staff at the K&Q would, I’m sure, help him out. 🍷🍷🍷🍷 This pub changed the world. Wear tweeds.